Oneplus 2 is the latest smartphone from the Oneplus team and most of the android fans already bought the phone. Some of them already rooted the Oneplus 2 and enjoying the custom ROMS or any other tweaks on the Oneplus 2. If you are one of them who recently rooted your phone and now want to unroot Oneplus 2 and install the latest Oxygen OS firmware. Yes, you can do this easily in simple steps, no need to use any application or tool to unroot your Oneplus 2 android smartphone. All you need the latest Stock Oxygen OS Firmware and have to flash with te recovery and you are done. This guide also helps you to return back to the stock ROM On OnePlus 2. Below is the complete step by step guide and video, which you can follow n your Oneplus 2 and easily flash the stock firmware. This guide is only for the OnePlus 2 android smartphone. Don’t try this method on any of other Android devices, It may hard brick your device. Before following this tutorial do take the full backup of your Oneplus 2 Android smartphone and save it in some safe place. Step 1. Download the latest Stock Oxygen OS Firmware zip file here and save the zip file on your Oneplus 2 Internal memory. Step 2. Once the zip file is saved on your phone. Boot your Oneplus 2 in recovery mode. See here how to boot in recovery mode. Step 3. Once your phone in recovery mode. Select Wipe > Swipe to Factory Reset. Step 4. This will reset your phone. Once completed go back to the Main menu of recovery and Select the Install option. Step 5. Now browser the Zip file that you saved on your phone in Step 2. Select it and flash the same on your phone. Step 6. Now the Flashing process will start on your phone and this will take some time to complete. Step 7. Once Oxygen OS zip file is flashed, go back and Reboot System. Step 8. Now your phone will reboot and first boot will take some time to apply the changes on the phone. That’s it! 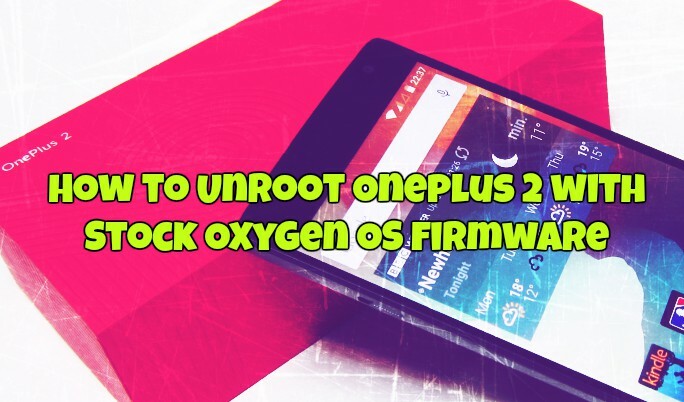 Now your Oneplus 2 android smartphone in unroot and running on the latest Oxygen OS Firmware. For any kind of help and query regarding the process, do comment below, I will try my level best to solve them. what if the device is bricked, How can i unbrick with same firmware?